The three Old Masters boxes were vinyl re-issues of old albums - ironically, they did not use the old master tapes, as they were remastered or remixed. To make things easier for me and not for you, any differences between the Old Masters version of an album and other versions are, at least for now, covered on the album's individual page, and not on the Old Masters page. At any rate, they were often the same versions that turned up on CD later. (There were also so-called Mystery Discs in two of the Old Masters boxes, which had previously unreleased material on them. These were re-issued on CD as Mystery Disc in September 1998.) A fourth Old Masters box was planned, but not released - it was to include a third Mystery Disc, which "didn't fit" in the third box (source: Richard Lehnert, Stereophile Magazine Volume 12 #6, June 1989). I have all 3 Old Masters, and have been so ridiculously careful with them that I can proudly say there isn't so much as a click on any track in all 3 volumes. This vinyl seems to be EXTREMELY HIGH QUALITY - it seems as quiet as the great German classical labels (DGG, Telefunken, &c.). Arthur and Chad were credited on the initial release of those mixes in the first Old Masters box. These credits were in the booklet, not on the album covers. (Also in the booklet, Jimmy Carl Black and Roy Estrada were credited only with vocals on We're Only In It for the Money, and on Cruising with Ruben & the Jets Jimmy Carl Black and Art were credited with "old drums" and Roy again with just vocals.) When the CDs came out, they just reproduced the LP covers, and neglected to add the credits for the supplementary musicians. The covers of the original "mystery disc" sleeves were a simple design of a pseudo-rubber stamp on a plain ground, the one in box 2 being a variation in color I think. (I don't have copies of the Old Masters box sets, so I'm going from memory, my notes, and copies supplied to me in the beginning of production of the Mystery Disc CD). I could have used the pseudo-rubber stamp, but I didn't think it was particularly distinctive, so I chose to design a new cover. Of the Old Masters box art, there were 3 different paintings - one on each box, and I think there was also the Old Masters sampler album with a Donald Roller Wilson painting on the cover. I would also like to see this art reproduced, maybe they could be used for some future release(s). plus a "mystery disc" (BPR 7777-6), jam-packed with fun stuff like old recordings of the Mothers and pre-Mothers recordings. Since Freak Out! was a double LP, box 1 was a 7-LP box. The original tapes for this album were obtained after a lenghty and expensive court battle involving two record companies, a former manager, and his brother, an attorney. When the tapes were finally returned, the earliest masters were in wretched condition (due to improper storage at MGM's vault and 20 years of deterioration of the cheezoid quality tape stock originally used). Re-mixing was a necessity. The We're Only In It for the Money album and Cruising with Ruben & the Jets have new bass and drum track added (except for "Stuff up the cracks" - the original 8 track master couldn't be found, so the version included here is a re-EQ'd copy of the original 2 track mix ). All other cuts feature the original players. Every effort has been made to improve the audio quality of these old tapes. In some cases (Especially on the Mystery Disc), distortion on the original tape could not be removed. Audio science has come a long way in the past 20 years, but not to the point where it is possible to fix that kind of problem. Lyrics to all the songs are included, except for the dialog on Lumpy Gravy. Please note that the tunes from the Freak Out! album which were re-recorded on Cruising with Ruben & the Jets appear only in the Freak Out! lyric file. You must be a maniac if you bought this box ... but, it's people like you that make projects like this possible. Everybody at BARKING PUMPKIN thanks you for being deranged as you are. We hope you get a nostalgic hernia over box number one. We will be releasing one per year, for the next four years, making up the complete OLD MASTERS collection. Thanks again. The CD version of "Stuff Up the Cracks" has new brass added, which were not on the vinyl version (see Way Beyond Just Drums & Bass, an article reproduced from a bootleg CD version of the album). Was this brass also on the Old Masters version? There were also no lyrics to the Mystery Disc. Of course, there were never a fourth Old Masters box. "The Return of the Son of Monster Magnet" (Freak Out!) is called "Cream Cheese" in the booklet. "Trouble Every Day" (Freak Out!) is called "Trouble Coming Every Day" in the track list, but the lyric title is "Trouble Every Day". "The Chrome-Plated Megaphone of Destiny" (We're Only In It for the Money) is listed as being 07:09 in the booklet. On the 1995 CD it is 06:25 and on the Verve 50545X LP it's listed as 06:30. 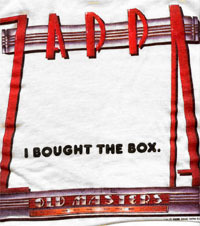 The American Frank Zappa Meets the Mothers of Prevention came with an order sheet for mail-ordering the Old Masters box 1, and if you did, you got a special Old Masters T-shirt with the box [saying "I BOUGHT THE BOX" - see top of page]. The price was $100 for US residents, and for non-US residents it was $115 for surface shipping and $140 for air mail delivery. At the time the first Old Masters set came out, in 1985, the Barfko-Swill hotline claimed that all those albums would NOT come out on CD! plus another "mystery disc" (BPR 8888-8), jam-packed with fun stuff like old recordings of the Mothers and pre-Mothers recordings. Since Uncle Meat was a double LP, box 2 was a 9-LP box. As with the first box, all the albums in box two have been digitally remastered and come with their original sleeves and inserts where applicable (these are contained in a bogus record sleeve featuring similar artwork to the box itself). Unlike the originals, which in the US all had heavy-duty matte cardboard sleeves, the re-issues are relatively flimsy affairs with glossy finish giving the covers a modern appearance. The discs themselves have benefitted immeasurably from the remastering process, especially the two live albums, both of which originally suffered from somewhat muddy sound but now sound totally rejuvenated. Each box is individually numbered and buyers are invited to obtain an "owner's certificate" by filling in and returning a postcard/questionnaire. and no "mystery disc". Since Roxy & Elsewhere was a double LP, box 3 was a 9-LP box. In September 1998, it was still available by mail-order from Barfko-Swill, for a price of $125. The "Mystery Discs" in first two boxes were shock-full of rarities, and the only way you could get them was to buy the boxes. They became very sought-after among people who could not stomach or afford to buy the boxes, and they were both bootlegged. Someone else realised the demand too, and in September 1998, Ryko re-released them on one CD, called simply Mystery Disc, as a bit of nostalgia for the old folks. The first two boxes were also accompanied by sampler albums, which you can read about in the Samplers section of the Weirdo Discography.